A couple of weeks back, my sweet tooth kicked in late one night, so I went in search of something to make. I found some really fresh Granny Smith apples, so I decided to whip up a “crisp”. A crisp is like a cobbler; the difference is the top. You could easily make this a cobbler by topping with a dough crust. Preheat the oven to 350F. In a mixing bowl, toss all above ingredients and mix well. Spread evenly into an 8″x8″ glass baking dish. Mix together ingredients in a small bowl and top the apple mixture with the crumble. Combine caramel candies and milk in a heavy saucepan over low heat, stirring frequently, until the mixture has a smooth consistency. Spoon the mixture over the crumble top of the crisp and bake in preheated oven for about 45 minutes, until the apple mixture is bubbling and the top is golden brown. Serve with a scoop of French Vanilla ice cream! 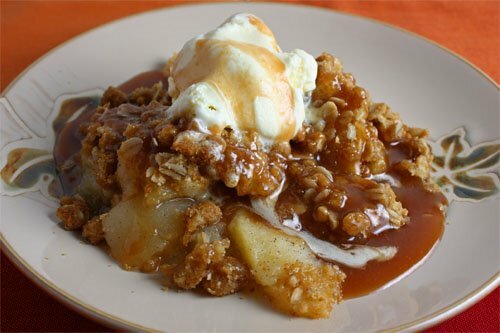 This entry was posted in Dessert and tagged apple, brown sugar, butter, caramel, cinnamon, granny smith, milk, oats by quarlj01. Bookmark the permalink. That would be fine. Feel free to use any that appeal to you. I’m always posting casserole recipes, because my customers at work love a good casserole and always want my recipes.